A major telecommunications company secured an "ideal location" for a cell site. Unfortunately, the proposed site was centered within an urban, residential area. The surrounding community had been established long before the cell site was contemplated, a noise variance was not feasible. To maintain schedule, the cell site construction moved forward with a cautious "wait and see" decision. Site noise levels were creating community complaints and a threatened legal action! 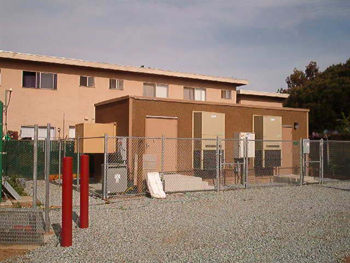 Near proximity of equipment shelter to property line and multi-family dwelling (NAC Class-1 Residential Land Use) did not not provide sufficient acoustical divergence to reduce equipment noise levels. (Reference Figure 1) Added turn-hoods were not only ineffective but actually aggravated the situation both acoustically and aerodynamically. 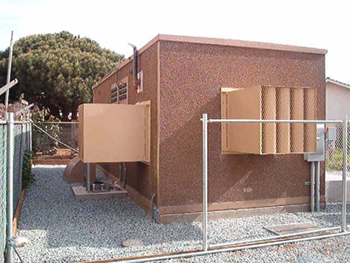 Main source of noise was the enclosed engine generator (EnGen) folowed by the shelter's exterior wall-mountedair conditioning systems. The site operator contacted us to provide an in situ fix. Drawing on a proprietary data base, we accomplished an aeroacoustic computer simulation of the installation and site topography based on client furnished data. 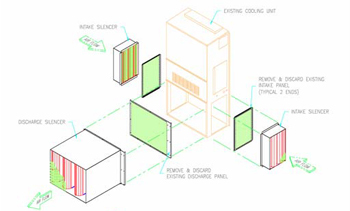 Silencer modules may be mounted to the shelter's exterior surfaces, as shown in Figure 1 and Figure 2, totally enclosed within the shelter's interior or divided into any combination of interior and exterior mountings as required (partial penetrations). Our modular design permits phased implementation, if desired, to assure a cost effective installation. With either a complete or phased installation, we fully guarantee both acoustic and aerodynamicperformance. 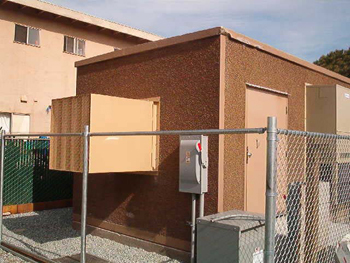 Should the HVAC noise also exceed acoustic criteria, a modular sound attenuator system is available that has been aerodynamically sized for each application. Each attenuator system utilizes existing air intake and discharge grille bolt holes for a rapid installation. (Reference Figure 3) The pictured attenuator system will reduce HVACnoise by a nominal 20dBA. More attenuation is available with longer silencers. "AWESOME! We can only hear wind noise. It is difficult to get a good reading...lots of ambient noise but it looks like a minimum 25dBA noise reduction!"